The Toybox tiny home is just 140 square feet and designed by Frank Henderson and Paul Schultz. On the outside a three cube structural design is enhanced by varying exterior treatments. Inside the cubes carry over to form three functional and versatile including a kitchen, bathroom, ample seating, and a sleeping loft. The tiny home features some comfort tech too. Radiant floor heating, blown in blanket (BIBs) insulation, and natural ventilation (cross & stack) keep the house comfortable year-round. Lighting and power are provided by outlets and LED strips that are carefully hidden throughout the home. The sloped ceiling is a finished plywood surface. 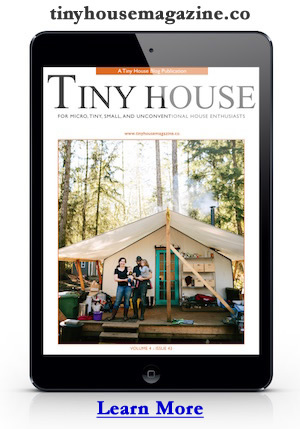 To learn more about this tiny house visit the Toybox Tiny Home website. This entry was posted in Tiny House Projects and tagged BIBs, blown in blanket insulation, cube design, Frank Henderson, LED strips, Natural cedar siding, Paul Schultz, Radiant floor heating, thermoplastic roof plane, tiny house, toybox, TPO. Can Off-Grid Solar Power Air Conditioning? Nice clean interior. I really like the lounging area with the sliding doors. Having a vista from big openings really makes it feel bigger inside and when you’re sitting around is when you really appreciate the view. Cute little house. Would like to see pictures of bathroom and loft. Very nice kitchen for such limited space!